Setting up Saraswati School’s new computer lab with equipment donated by Singaporeans. Pillay Krishnan gives students letters from pen pals in Singapore. When Pillay Krishnan took a year off in 1996 to teach English in Nepal, he never thought he would sow the seeds for kindness some 20 years later. Some of his students from the Saraswati School in Gorkha District have now become teachers at that same school. They are continuing his work of learning across borders by collaborating with Singaporean students, improving education facilities and processes there. A new building was completed within his first six months there, but there was not enough furniture. When Krishnan’s students in Singapore learnt about this through a pen-pal programme that he had initiated, they raised money for benches and desks. 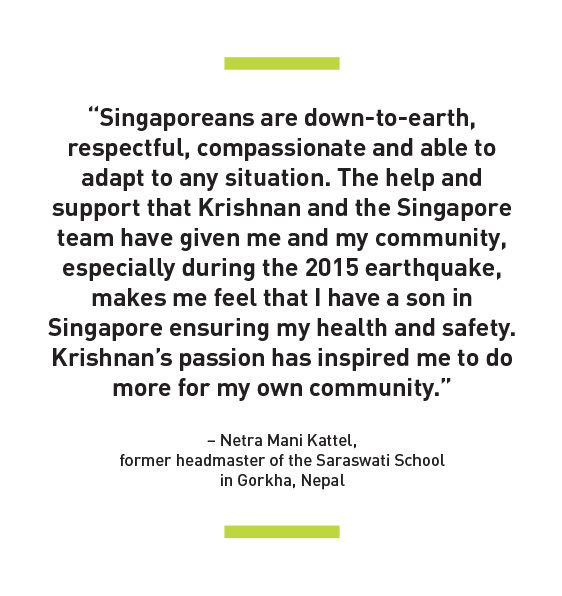 Krishnan returned to Nepal in 1999 with 20 of his Raffles Institution (RI) students on an exchange programme. The boys spent two weeks in Gorkha, painting the Saraswati School, sprucing up its library and setting up a garden. The inspiring collaborations between Singapore and Nepal have contributed to the improvements at the school, which now serves about 900 children. One of those teenage boys, Kumaran Rasappan, later became a doctor and returned in 2012 to scale Everest and raise money for the school. The S$10,000 raised went towards computers and books. He also invited Krishnan to return to the school with him. That trip triggered a chain reaction. In 2013, another group of RI boys went to Nepal to set up a science lab and develop a science curriculum at the school. In 2015, after the Nepal earthquake, Dr Kumaran and his wife returned to give humanitarian aid. The S$40,000 they raised went towards zinc roofs for 105 families in two villages in Gorkha, and repairing facilities at the Saraswati School.The couple and six medical undergraduates later went back in December to hold health screenings and hygiene workshops, provide medical supplies and share skills with local clinical staff. Krishnan, his wife and daughter joined them.